The Benedictines have been serving God and His Church for over 1500 years. The order was founded in Italy in the 6th century by Saint Benedict of Nursia, during a time in history when ungodliness and a lack of faith and morality permeated society. In 1852, a group of Benedictine women from Bavaria, Germany (the same region where Pope Benedict XVI hails from) founded a monastery at St. Marys, Pennsylvania. Mother Benedicta Riepp was the foundress of the monastery. As the community of sisters grew, branch houses were founded in various parts of the United States. Branch homes were founded in St. Joseph and Duluth, Minnesota, and in 1919 a monastery was founded in Crookston, Minnesota. 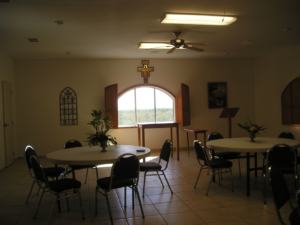 Sisters from the Mount St. Benedict Monastery, Crookston, MN established the Benedictine Monastery of the Good Shepherd in El Sauz, near Rio Grande City, Texas, as a dependent monastery in 1991. The pioneers of the Texas monastery are: Sister Frances Solum, Sister Luella Walsh, and Sister Nancy Boushey. In 1986 the pioneers of the Monastery of the Good Shepherd came from their motherhouse in Crookston, Minnesota to share life with the people of South Texas. They brought with them the 1500 year tradition of Benedictine monasticism that traces its origin to the life and work of the great St. Benedict of Nursia who lived during the fifth and sixth centuries. The legacy of St. Benedict has received attention from our pope Emeritus Benedict XVI who chose his papal name to signal his desire to make the re-evangelization of the Church a priority. He wanted to remind the Church of the success of the Benedictines in spreading Christianity throughout Europe after the fall of the Roman Empire in the fourth century. 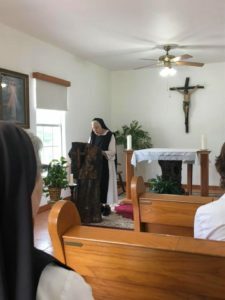 The benedictine Sisters have been serving the Diocese of Brownsville primarily by their witness of community life and prayer and by offering hospitality to those who wish to step back from the hectic pace of life to encounter God. 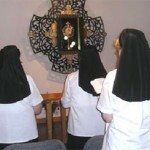 The Sisters wear the traditional habit, meet five times daily to pray the Liturgy of the Hours and are faithful to the Magisterium.